Recently I was trying to clean out some vintage clothes which came my way. The selection is quite impressive and the variety of eras range from the 80s through to the 70s and 60s. I found myself having to launder them, just to refresh them before putting them away. As I researched some of the materials, I found out for instance, that silk, which incidentally is one of my most beloved textiles, was not run-proof before the 80s. 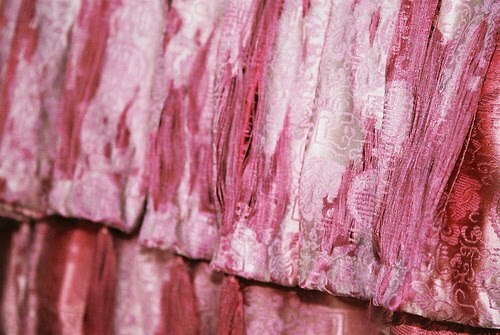 Sure enough, one dress, a fuschia pink evening fitted gown, did have its colour run as I handwashed it all so delicately. 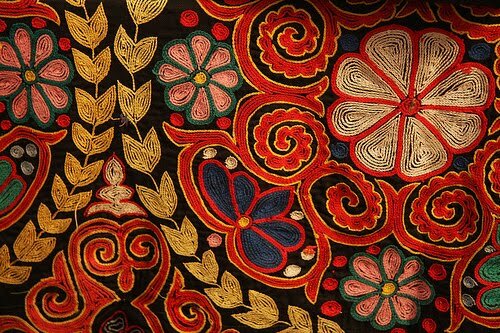 In some instances though, I am sure that unless one finds an expert laundery which is professional in handling the really delicate laces, embroideries and really old textiles, then it's best to leave things be. Another issue is recognising textiles which are in garments that do not come with an identifying label. Many times, I find myself at a loss - is this viscose or a mixture or is it silk? Some silks are quite thick, others are sheer and then there seems to be a fine boundary line between sheer chiffon and a particularly delicate kind of silk. 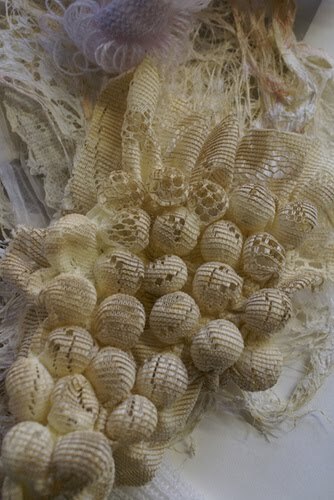 Things become complicated when delicate materials are embroidered with threads that tend to run. How on earth do you clean those? Is dry cleaning enough? One lady mentioned steaming clothes... but how is that done? And is it suitable for all kinds of garments? Another issue - moth-eaten woollens. Along with the lot of clothes I had to clean, I discovered this beautiful multi-coloured check jacket... really warm and chique. BUT! Moths had been at it and the textile was eaten right through in some places. I decided, it was best to get rid of it before other clothes got infested. Am still wondering whether I could have done differently, but who would have wanted to wear a moth-eaten jacket anyway? Do any FairyFiligree readers have any hints or pieces of advice to share about this topic? I think it was wise to contain and remove the moth eaten clothing. You probably could have had it dry cleaned to kill off the other larvae responsible, but if it was that badly damaged it sounds like it was too late (and since you can't see the little suckers very easily, keeping the item in the closet could lead to a disastrous infestation). People wrongly think if you store the affected item in cedar it will kill the moths, but once an item has been affected, the cedar doesn't do anything. When it comes to identifying fabrics, it's a process of learning by comparison and contrast in terms of sight and feel AND often you can get pretty close to identifying fabrics based on the time period you think the garment is from. 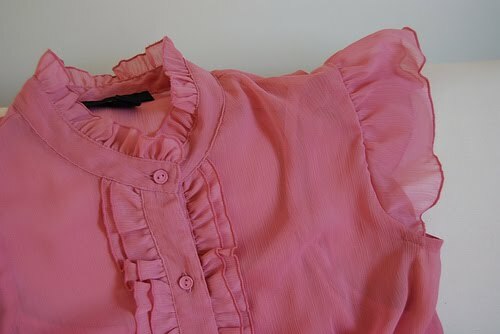 For example, silk and chiffon were very common fabrics in the 20s and early 30s. Rayon, touted as a cheaper more durable fabric with a silk-like feel was so prevalent in the mid-to later 30s and 40s because it was around this time that its clothing applications really took off (I think it was "invented" in the late 20s). Synthetics tend to be more common in clothes from the 60s and of course the polyester loving 70s, but by the 60s most clothes have care and content labels anyway. Often, clothes from the 80s and 90s are made of things like acetate as opposed to silk, and even if an item feels chiffony, it's often a synthetic blend. Textile experts will tell you to look at the weave or do what's called a burn test when trying to make finer distinctions as to the content of a fabric, but I find that confusing. I have a vintage sewing book that has a section on how to identify fabrics and that has proven useful at helping me build my textile vocabulary. I also google a lot; if I think something is rayon but I'm not sure, I look up the definition in an online textile guide, etc. Hope that helps?? Hi dear, I just wanted to pop over really quickly to say that I think the seller of that antique catalogue states that they'll ship internationally. I remember reading that yesterday when I posted (about) it, so unless they've changed their auction since then, they should ship outside of the US. Many thanks for your kind comments, honey! I hope you have a beautiful day!